Devils Lake, ND - Mother Nature and Devils Lake have a bumpy marriage. More than a century ago, paddle wheelers were operating on these North Dakota waters. Then, the lake shrunk to about 40,000 acres by the early 1990’s. Since then, Devils Lake quadrupled in size. This spring, Mother Nature will add even more water, creating new shorelines in cattail marshes and farmland. All three offered advice on fishing, but first, what about that water? The man in the know is Jeff Frith, Devils Lake Basin Joint Water Resources Board manager. Last summer and fall, areas north of the lake received 35 to 40 inches of rain, a foot or more above average. The ground, soil and marshes became saturated. The entire region felt the wrath of severe December and January storms with extremely wet, heavy snow. To put the situation into perspective, Frith said, “The most recent estimate is that 780,000 acre/feet of water is poised to move downstream. That amount of water would cover 780,000 football fields with one foot of water. Or, look at it this way: The North Dakota capitol building could hold 18,000,000 gallons of water. The amount we’re talking about would fill the capitol 13,773 times.” If the lake only goes up one foot, another 10,000 acres of land will be covered. If it rises between three and four feet, Devils Lake will again reach 200,000 surface acres. Johnnie Candle said, “Moving water congregates all species. Current seams in coulees, near culverts and bridges makes fish very predictable. Jigs and minnows, Jigging Raps and Shiver minnows or swimbaits will catch fish. 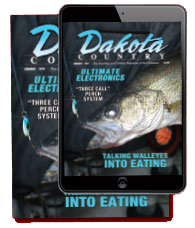 I like a jig and a three or four inch white grub body this time of year.” He notes that higher water levels attracts baitfish to freshly flooded cover, and swim baits, Shad Raps or Flicker Shads are the answer. “Always have a slip-bobber ready. When you net one walleye, toss a bobber and leech in the vicinity. Hang on!” he said. Jason Mitchell urges early-season anglers to key on newly flooded waters. 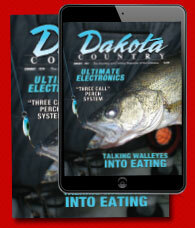 “They warm up faster and these bays load up with walleyes. Pitch crankbaits, soft plastic swim baits or slip-bobbers. I really like light jigs tipped with Kalin’s Sizmic grubs.” He advised shore anglers to check out Channel A or the Mauvais Coulee. With new fishing piers and miles of rip rap, Devils Lake may have more shoreline fishing opportunities than almost any other lake in the upper Midwest. Aaron McQuoid agreed with the shallow water recommendations of Candle and Mitchell, but added, “Pay attention to water temps. Late afternoons and evenings are best as waters warm. Fish shallow and experiment with color.” All three really take care of their clients with the latest and greatest gear and know-how. They have the advantage of spending nearly every day on the water, and can answer questions and handle family, friends and business groups plus lodging needs. For more information about Devils Lake water levels, ramps, fishing reports for walleye, pike, perch and white bass, community activities, fishing tournaments (the 41st Chamber Annual Walleye tournament is June 23-25), guides, lodging, dining, casino, resorts and much more, go to devilslakend.com, or call the Tourism office, 701-662-4903.